Jerusalem In Color Challah Cover CAT# CHE-27. Chain - stitched hand - embroidery on raw cotton using various colors of silk, gold and silver threads. Size: 20" x 16". 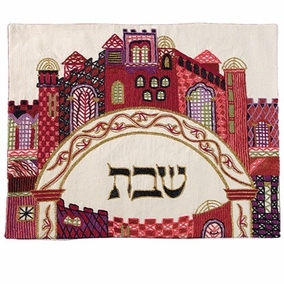 .A challah cover is a special cloth used to cover the two braided loaves (challah) set out on the table at the beginning of a Shabbat or Yom Tov meal. While its appearance lends a decorative and ceremonial aspect to the set table, its presence serves both a halakhic and symbolic function.